Fear of going to see the vet is one of the most common phobias in dogs. Even the most happy-go-lucky canine may cower and tuck its tail as you try to coax it through the door of your veterinarian's office. While your dog might never learn to love a trip to visit the veterinarian, there are steps you can take to assuage some of the anxiety your pet feels when it senses a vet visit is imminent. Why Do Dogs Fear the Vet? The most common reason that dogs develop a fear of going to the veterinarian is that it feels traumatic to them. Think about a typical visit to the vet's office with your dog. As soon as you walk through the door, your dog is bombarded by strange smells and sounds. Chances are you'll run into other animals while you're there, which is sure to raise your dog's anxiety level as well. Next comes the examination. Your dog is restrained by a veterinary technician while the veterinarian pokes and prods it, possibly giving vaccinations and drawing blood. This unfamiliar type of handling by strangers can cause your dog to become confused and afraid. If your dog is sick, it's already feeling bad. Add it all together and you get a pretty traumatic experience for your dog. It's no wonder so many dogs develop a fear of going to the vet. The good news is that your dog's fear of the veterinarian is fairly easy to conquer if you're willing to put in the necessary time and effort. Even if the fear isn't completely eradicated, it's possible to ease a lot of your dog's anxiety. Eventually, you may even be able to get your dog to love the vet. Try a few approaches to help make your dog's next annual checkup a lot easier for both of you, but keep in mind that depending on how severe the anxiety is, you may need to involve your vet in finding the right solution. Part of what makes visits to the veterinarian so scary is that your dog isn't used to the handling it receives during an exam. You can get your dog used to this type of handling by practicing at home. Spend some time each day checking its ears, restraining it, looking at its teeth, and holding its paws. Be gentle and make sure your dog gets lots of praise and some treats during the practice exams. The only time some dogs see the vet is when they're sick or it's time for their annual exam. Try to make arrangements with your veterinarian's office to stop by several times for nothing more than a social call. Ask the receptionist to give your dog a few treats and some friendly petting, and soon your dog may look forward to visiting the vet. Gently practice going into the vet's office during social visits and don't force your dog. Let it take its time getting comfortable with the idea, rather than dragging or carrying it in. Reward your dog with lots of treats and praise as it edges closer to going through the door. Although many people consider it a last resort, some dogs are so fearful of the vet that medication is the only option. Your vet may be able to prescribe an anti-anxiety drug that you give your dog at home before visits to the office. You can also use this as a tool to practice social visits and handling. It's important to understand that a dog is incapable of learning new things when it's in a state of high anxiety. Medication can help bring the fear and anxiety down to a level where the dog can respond to training and socialization and may not be needed permanently. If your dog's fear is so strong that it results in aggression, you may want to consider using a muzzle during trips to the vet to prevent a dog bite. Get your dog used to the muzzle slowly at home by having it wear the muzzle regularly and being lavish with praise. If you wait until you're about to leave for an appointment before introducing your dog to the muzzle, it may quickly associate the muzzle with the vet and develop a fear of the muzzle. Make the experience as positive as possible. 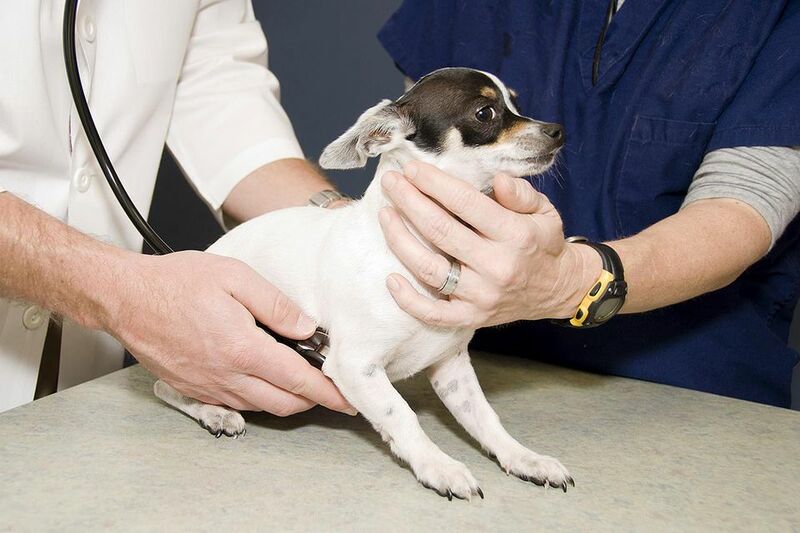 More and more veterinarians are willing to come to your home for routine exams and vaccinations. You may be able to ease your dog's fears by making it comfortable in its own home during examinations. Search for mobile vets with good reviews that are in your area. It's important for you to understand that your dog won't immediately get over being afraid of the vet no matter what steps you take, so exercise patience and be consistent. Talk to your vet for help with this situation. The vet and her staff truly want to help you and your dog, but communication is essential. If you and your vet can't get your dog past its fear, it may be time to get assistance from a dog trainer or behaviorist.